The carbochemical industry at Industrial Química del Nalón, S.A. 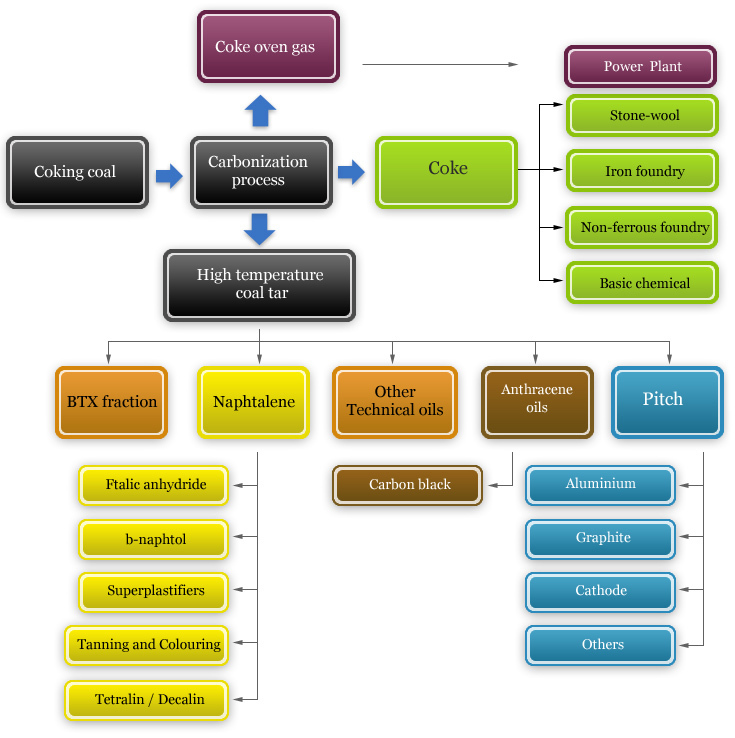 The starting point of the carbochemical industry is coking coal. This raw material determines the main characteristics of the products to be obtained from its industrial processing. In this process, coking coal becomes coke, generating at the same time two main by-products: coke oven gas and high temperature coal tar. Coke oven gas is a noncondensable gas, which is generated at the carbonization process. Due to its high energy capacity it is used partly as fuel at the process itself and partly for electric power generation. High temperature coal tar is defined as a condensed product obtained by cooling down the gas generated during the carbonization process. Coal tar is a black, sticky liquid thicker than water, which is mainly composed of polycyclic aromatic hydrocarbons, phenolic compounds, aromatic nitrogenous bases and its alkilic derivatives. Coal tar is the main raw material from which the major part of the carbochemical activitiy is carried out. BTX fraction (benzene, toluene, xylene). Other applications (needle coke, refractory materials, etc.). Anthracene oil is used as a raw material for carbon black manufacture. The rest of technical oils are used in several industrial applications.